The equine industry has close to $2.6 billion impact on Michigan's economy according to the American Horse Council Foundation. The American Horse Council Foundation recently released a number of statistics of the economic impacts that the horse industry has on Michigan. The two year study broke down the impact into five different sectors. The racing sector supports 3,946 jobs and creates a total impact of $389 million. The competition sector supports 11,942 jobs and has an economic impact of $1 billion. Recreation, equine therapy, and equine rescues & sanctuaries make up over a half a million dollars in economic impacts on the industry. The total impact on Michigan’s economy comes out to $2.6 billion. Horses activists and enthusiasts believe that number should be higher. Retired Army Colonel Don Packard now serves as president of the Michigan Horse Council. He rode in the 2016 inaugural parade as part of the Michigan Mounted Police Unit. It was the first time that a person and not a member of the unit has ridden with the group. The retired Army Colonel looked at just the sheer dollars that go into the equipment to haul a horse as testament for a higher economic impact. A few aspect have put financial dents into the amount of dollars from the equine industry into Michigan. Public Act 288 increased the amount of trails and roads for off-road vehicles. For horse owners, motorized vehicles can cause panic and flight in horses. These trails no longer become viable for horse trail riders to utilize. In addition, two major horse racing tracks have closed within the past few years, leaving only Northville Downs. “Horses have been around much longer, we have a right to ride in this state and we plan on pursuing that aggressively as often as we can,” said Packard. Packard is one of the few to ride from Lake Michigan to Lake Huron on horseback. 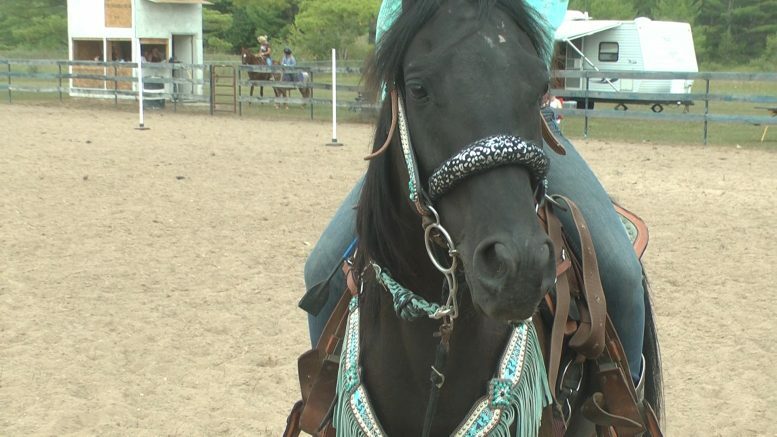 His passion in horse culture and riding can be found through the 8 trips across the state. In Northern Michigan, horse riding and the great outdoors combine to make this region a perfect tool for equine education and culture. In Mackinac Island, Ashley Day, Program Manager at the Mackinac Community Equestrian Center, helps out with education of people on respect and proper use of horses. Education and exposure to horses will be the tools that local community horse organizations use to help the equine industry continue thriving. Jackie Konecke of the Alpena County Horsemen’s Club wants more people to spend time with horses. By gaining more exposure, the horse activist expects to see more benefits than just a new found love. Pairing the beauty of the area with an outdoor activity creates another draw for people to visit and enjoy the opportunities available. Throughout the year, both Mackinac and Alpena’s horse organizations offer a number of activities, competitions, shows, and community outreach that helps ensure horses as part of the cultural and communal fabric that makes up Michigan.